1. 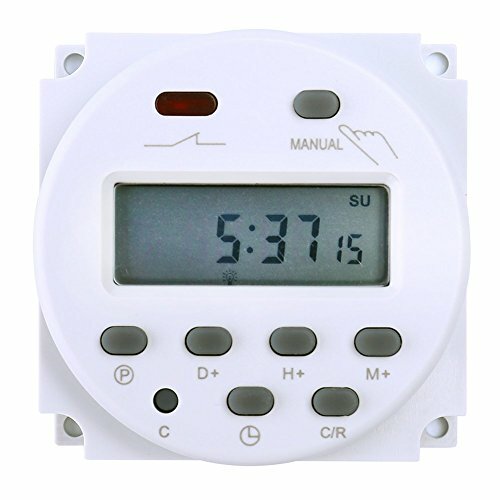 The program timer can automatically switch on and switch off various kinds of electric equipment according to fixed time. 2. Used widely to control the lamp, water heater, sprayer, bottler, preheater, agriculture facilities, broadcasting equipment, home appliance, etc. 3. Panel mounted, advanced pre-setting one week before, digital electronic timer switch with daily programs, repeat programs with 17 on/off setting and manual over-ride, auto timer error correction ¡À 30 sec, weekly. FAVOLCANO is a registered brand, and protected by US trademark law. FAVOLCANO products are sold by authorized sellers only. We are professional in electronic products.